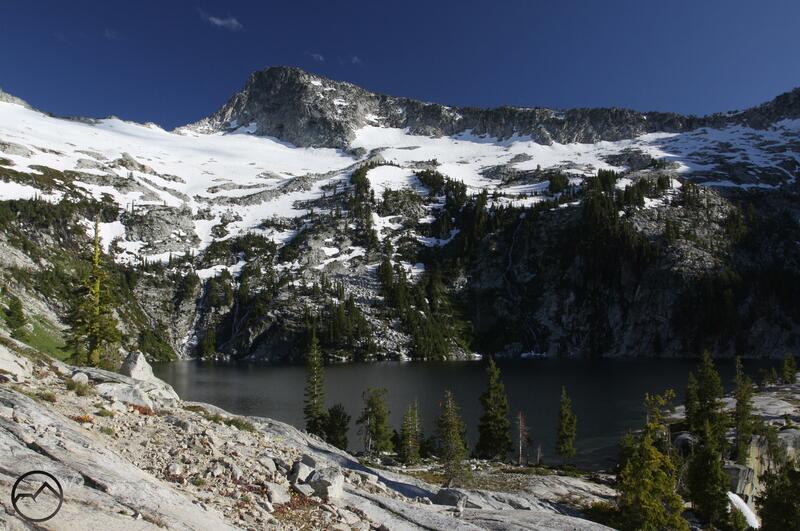 A difficult trail through the Trinity Alps with exceptional payoff, the Grizzly Lake complex. Here one finds majestic granite peaks, a surprising glacier, a magnificent, large alpine lake, a stupendous waterfall and verdant meadows beneath soaring cliffs. All of it is arranged perfectly to form one of the most spectacular spots all of the American West. Thompson Peak and Grizzly Lake. 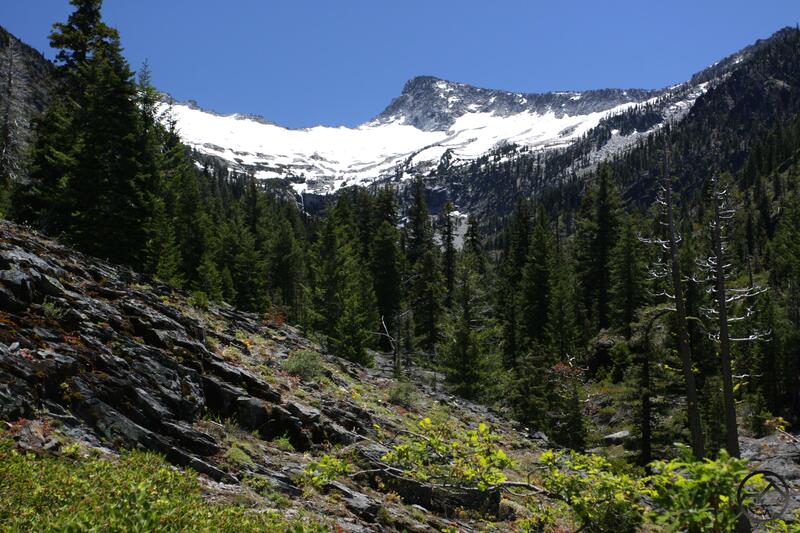 Though there are several places in the Trinity Alps boasting immense proportion, spectacular scenery and tremendous beauty, in the end the Grizzly Lake area is the scenic pinnacle of the range. It has all the best features of the alpine sublime: massive granite peaks, a unique glacier, a large, deep glacial lake, a tall thundering waterfall and verdant meadows through which flows a cyan stream. These elements are not unique to the Grizzly complex or to the Trinity Alps but their arrangement at this particular place is such that this area is elevated above all others in the North State and for many miles beyond. It is a scene of singular majesty, a place of unparalleled artistry among mountain temples. It is, along with the awesome bulk of mighty Mount Shasta, the twin jewel in the crown of California’s North State. Indeed, this is one of the great alpine visions from the American West. Of course, the stunning excellence of the Grizzly complex does not necessarily translate into wide-spread notoriety. 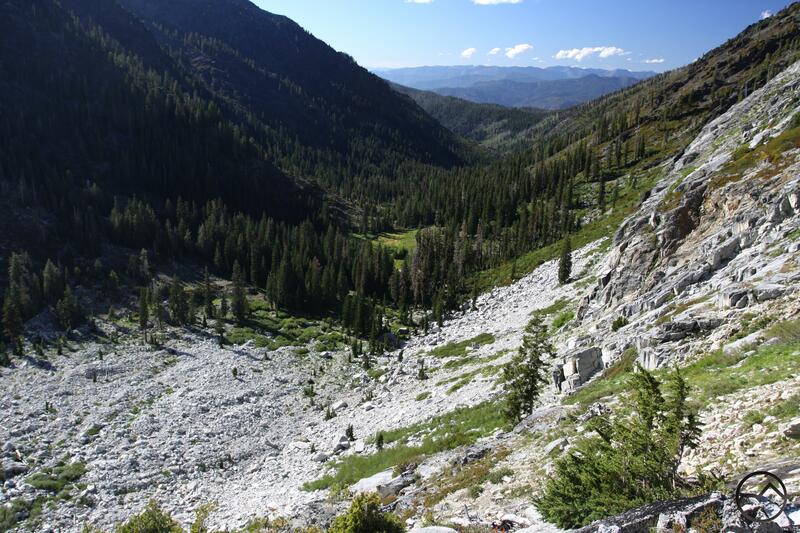 The Trinity Alps themselves are not well known outside of Northern California. The general anonymity of the range sifts out the preponderance of people who would likely attempt to visit such a magnificent place. Access to the Grizzly Lake area is not easy and acts as a filter to further reduce the number of people who would seek out such a mountainous paradise. The Grizzly Creek Trail is the only route that reaches the Grizzly complex and it does not have a trailhead that can be reached by car. Instead, the Grizzly Creek Trail is connected to two different trails, each presenting a different challenge to those heading to the lake. The first trail, the North Fork Trinity River Trail, is long. 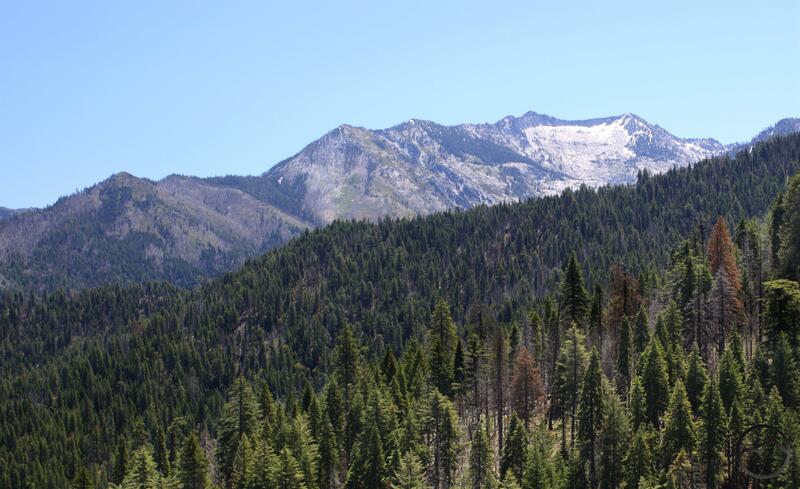 It requires a 15 mile journey just to reach the beginning of the Grizzly Creek Trail. For most, this demands a significant commitment of time. The other option, the China Spring Trail, is only two miles from the trailhead but they are an excruciating two miles, with brutal elevation gain and dispiriting elevation loss. Once on the Grizzly Creek Trail, the journey is not without its challenges. The last couple of miles climb steeply and the final, short climb up to the lake itself is a “scramble” rather than an acknowledged trail and is the steepest section of the entire journey. Amazingly, such challenges, though they prevent the vast majority of people from ever setting eyes upon one of the great natural wonders of the West, still does not mean that absolute solitude is possible at this wondrous place. 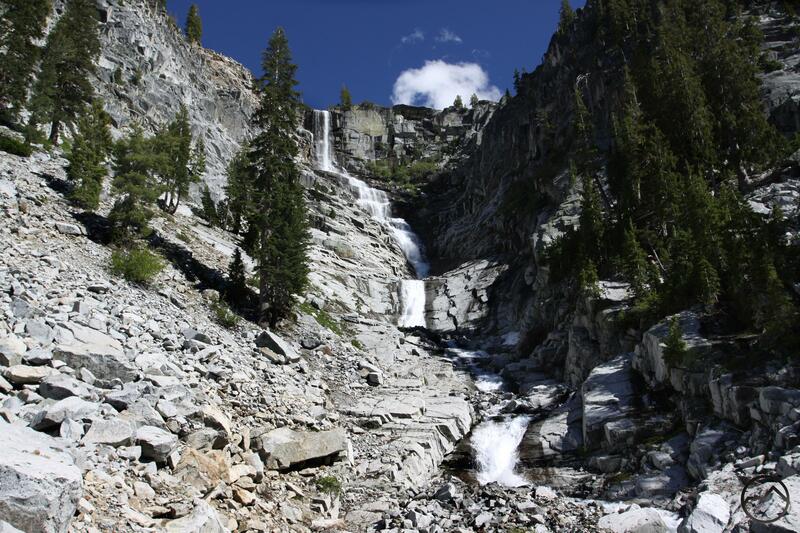 Prior to the construction of the China Spring route to the Grizzly Creek Trail, it was necessary to make the long journey up the North Fork of the Sacramento if one planned on seeing Grizzly Lake and Grizzly Falls. Since the China Spring Trail was built, the vast majority of those going to the lake now use the path, despite its steep rise and drop, lack of scenery, and its brutal reputation. To most, the qualities of the destination and the opportunity to taste them so soon after leaving the trailhead more than make up for the pain extracted in exchange for the relative short duration of the trail. Consequently, this trail description will follow the China Spring route to the Grizzly Creek Trail. Whatever challenges may confront those determined to get to the Grizzly Lake area, it is a worthy endeavor. It is a place of distinct beauty; the site of one of the West’s most uniquely and spectacularly arranged features: a glacier clad lake pouring itself over a 600 foot waterfall. Indeed, it is one of America’s wilderness crown jewels, even if a relative few ever hear of it and even fewer have the opportunity to set eyes upon it. For those that do make the journey, the memories of the granite cliffs and tower, glacier and cascade, thundering waterfall and bucolic meadow will remain with them for a lifetime. Caribou Mountain from the China Spring Trail. The China Spring Trail begins at a sharp turn in the dirt access road that climbs high above the South Fork of the Salmon River. The trail makes a brief drop down to an old road bed, crossing the wilderness boundary almost immediately. Evidence of the nearly 30 years that have passed since the establishment of the Trinity Alps Wilderness is apparent in the numerous small trees that are growing out of the roadbed. As the trail heads south, views to the east open up, revealing massive Caribou Mountain and nearby neighbor Packers Peak. The South Fork of the Salmon forms on the far side of the Caribou Mountain and flows through the large gap between the two mountains. These are the only significant views for a long time to come. Soon the trail, climbing only moderately, bends to the right and enters an area with significant fern and grass growth, accompanied by the sound of running water. The trail crosses a small stream and bends to the left, climbing out of the stream’s gully. Climbing at a steeper grade now, the path soon crosses another stream as it climbs to the east. In short order the trail bends to the south again and levels off a little bit. Unfortunately the level stint offers a false of accomplishment. Shortly after leveling off, the trail makes a tight switchback and begins climbing in earnest, climbing steeply back toward the second of the two streams. Long before it would cross the stream, the trail switchbacks again and begins a steep climb up toward the top of the ridge. Rather than easing the grade as one nears the top, the trail continues to steepen all the way to the end when, finally and blessedly, it reaches the top of the ridge amidst a ghost forest of burned out snags. The climb is over. For now. Thompson Peak peeks through the snags at Hunter’s Camp. The level spot at the top of the ridge is known as Hunter’s Camp. Before the fire incinerated the trees, it must have been an interesting place to camp. Though the charm of the immediate area burned with the forest, it is possible to peer through the snags and catch glimpses of Thompson Peak, its attendant glacier and even Grizzly Falls to the east. This is the only view of the magnificent destination for many miles to come. To get there, one must make the descent down to Grizzly Creek. The trail drops as steeply as it climbed, though it lacks what little scenery there was on the ascent. Ferns grow near the summit but beyond that the trail passes through thick forest and lots of brush. Annoyingly, there are several logs across the trail, especially within the first 0.25 miles of the trip down. It is basically a long, straight drop down with little variation. Only near the bottom does the trail make a few, broad switchbacks, as if trying to slow hiker’s momentum before landing at the bottom of the Grizzly Creek Canyon. 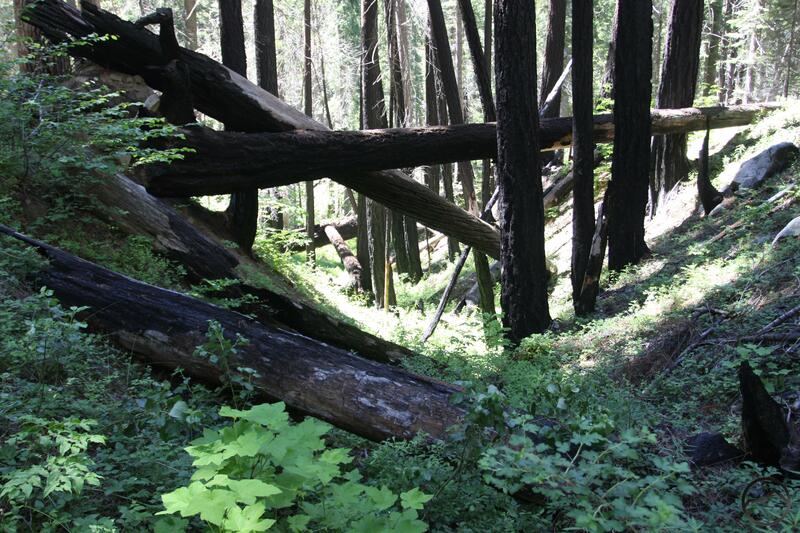 Fallen trees along the Grizzly Creek Trail. The descent ends at the signed junction with the Grizzly Creek Trail. If water is scarce, turn right and walk a short distance to where the trail crosses a small tributary of Grizzly Creek. When water needs are met, return to the junction and continue past, heading east, toward the sound of Grizzly Creek. The unfortunate reality of this section of the trail is that it has little interaction with the large, raucous creek. Though it is nearly always audible, the trail stays a fair distance away from it. This is generally the case for nearly 2 miles after the junction with the China Spring Trail. Still, even in the absence of the creek, it is a lovely section of trail. Massive old-growth trees are abundant and the trail passes through huge patches of thimbleberry. Though grand scenery is absent along this part of the route, there is also an absence of any significant grade. In short, this is the most restful part of the entire journey to Grizzly Lake. At times the trail veers far from Grizzly Creek, traversing across small canyons through which pour small creeks. Other times it comes to within sight of the water. Good campsites are often found along these stretches of trail. 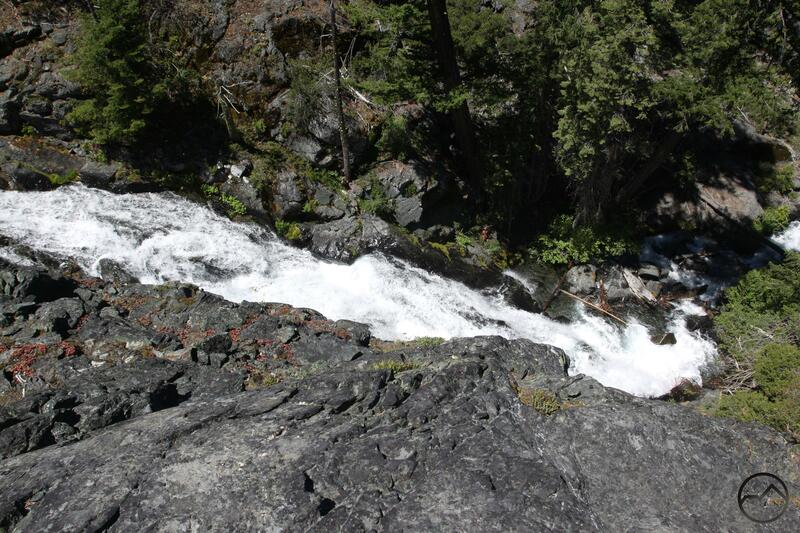 Looking down on Grizzly Creek’s first waterfall. The pleasant hiking ends 2 miles from the junction with the China Spring Trail. This is not to say that the trail steepens considerably, but the change in the trail’s grade is noticeable and remains constant all the way to Grizzly Meadow. The change is recognizable at a series of switchbacks that climb away from the creek as it surmounts a large band of dense rock running across the canyon. Perceptive eyes will see distant whitewater through the trees, a brief glimpse of the first of Grizzly Creek’s many waterfalls it displays all the way to the meadow. Upon reaching the top of the switchbacks, the nature of the trail suddenly shifts. Rather than being under dense forest canopy, the trail now emerges into the open, moving across naked, sedimentary rock. After the trail straightens out, it is possible to make a short cross-country jog over the rock to peer down on the large waterfall that was visible from down below. Though not completely vertical, these are the tallest falls prior to Grizzly Falls, but they are by no means the prettiest. The falls in the fissure. Back on the trail, the path is now routed much closer to Grizzly Creek. The personality of the creek itself has changed dramatically. Where before it raced through the dense forest the blanketed the bottom of Grizzly Creek Canyon, now the creek jumps from one waterfall to the next. Of course, such a shift indicated the increased grade of the trail. It is impossible to count how many cataracts the trail passes along this section of the trail but they are prolific. None are exceptionally tall but there are several in the 25-35 foot range. A few are particularly memorable. One short cataract finds itself pouring into a deep fissure in the canyon bedrock and then hurtling out the side of the crack. What makes this especially unusual is the fact that the fissure was not created by erosion but was formed by the faulting process in the bedrock. Consequently, the fissure extends beyond the creek, towards the trail. It is possible to climb down into the crack and hop right up to the edge of the water is it floods into the fissure. It is an unusual sight. 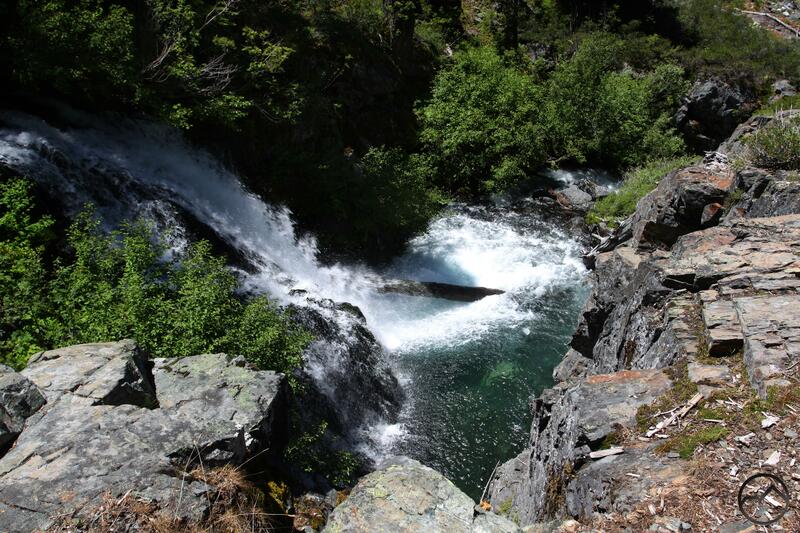 A major cataract on Grizzly Creek. The trail itself is far more interesting at this point. The course of the Grizzly Creek Trail gives hikers many opportunities to examine this rock. It is routed across the exposed rock and often slung on narrow, rocky ledges above the creek. For most of the hike the rock consists of dark metamorphic stone. It is in marked contrast to the bright, white granite that awaits in the giant cirque that holds Grizzly Lake. Though the trail does veer away from the creek at times, it always returns to the water, often with a new waterfall in view. Grizzly Creek it is not a small stream but a large, violent waterway and the volume of water is tremendous. 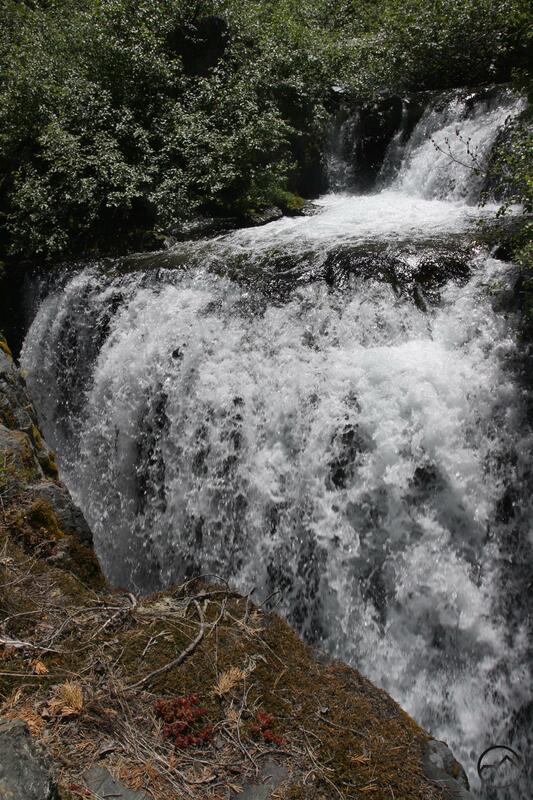 As a result, the waterfalls along the creek, though not tall, are powerful. Often they fall into beautiful pools of cyan water. Despite the creek being out of reach from the trail, it remains a refreshing sight in the midst of the long climb up to Grizzly Meadow. The first good view of the Grizzly Lake cirque. After climbing a short, steep grade, one finally gets a clear view of the Grizzly Lake cirque. 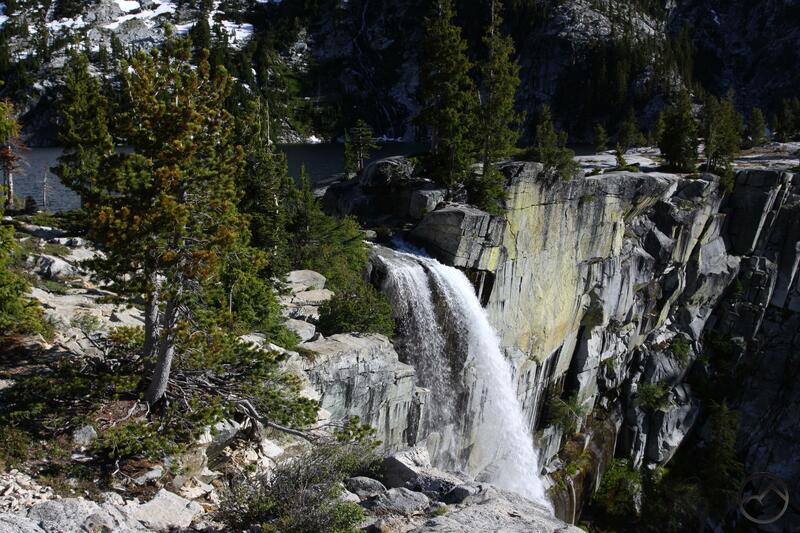 Monumental Thompson Peak rules the scene but a partial view of Grizzly Falls lures hikers to press forward. The Thompson Glacier and mighty-but-forgotten Julius Caesar Peak (partially blocked by trees) also make an appearance. From the point where the cirque is first revealed the trail continues to climb, at times a little more moderately, and veers away from the creek into some forest cover. Soon the trees begin to thin and the rock terrain is increasingly covered by grass and other denizens of meadow environments. Eventually the canyon floor levels off and the trail’s grade becomes very moderate. Views up the rocky canyon walls become more abundant as the trail finally comes back into close contact with Grizzly Creek. These features mark the outskirts of Grizzly Meadows. Paradise unfolds above Grizzly Meadow. The arrival at the meadow is marked by a narrow band of trees through which flows Grizzly Creek. Beyond the trees is the open, grassy expanse of Grizzly Meadows. Where the creek leaves the meadow and enters the trees, it transforms from a lovely, meandering stream to the roiling creek it has revealed itself to be alongside the Grizzly Creek Trail. 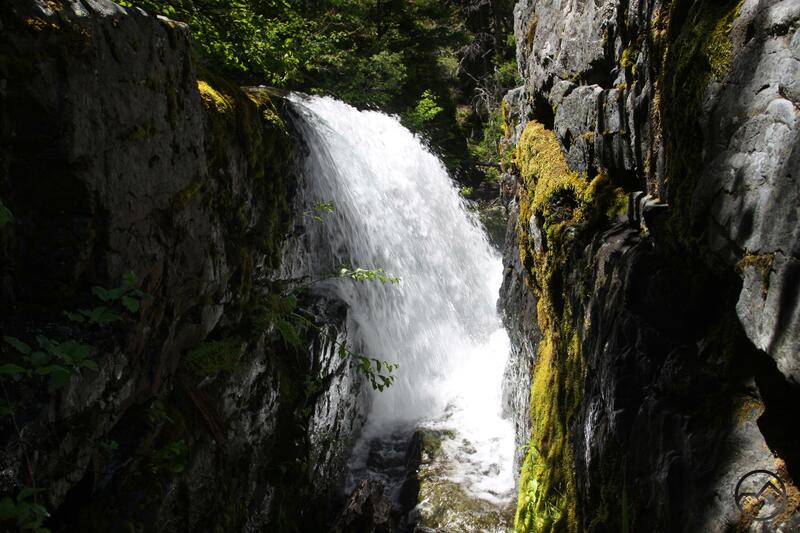 The conversion is marked by a small waterfall (though small, this proves to be the final cataract until hikers reach the base of mighty Grizzly Falls) pouring into a pretty pool before continuing on down the canyon. There is a campsite right along the trail, adjacent to the small waterfall. This is the best campsite in the meadow area and it boasts a phenomenal view (if this site is available upon arrival, grab it!). Stretching to the west is lush Grizzly Meadows, through which wanders the clear waters of Grizzly Creek. In the distance rises the vertical rampart of the Grizzly Lake cirque. Down the face of these imposing cliffs thunders Grizzly Falls. Its first drop is a sheer 100 foot freefall. It then hammers a bulge in the cliffs and plunges over a series of beautiful falls before finally roaring into a vast boulder field spreading out beneath the falls. Above this magnificent scene is the splendid tower of Thompson Peak and the unusual but stunning Thompson Glacier, the only glacier in the U.S. entirely below the treeline. 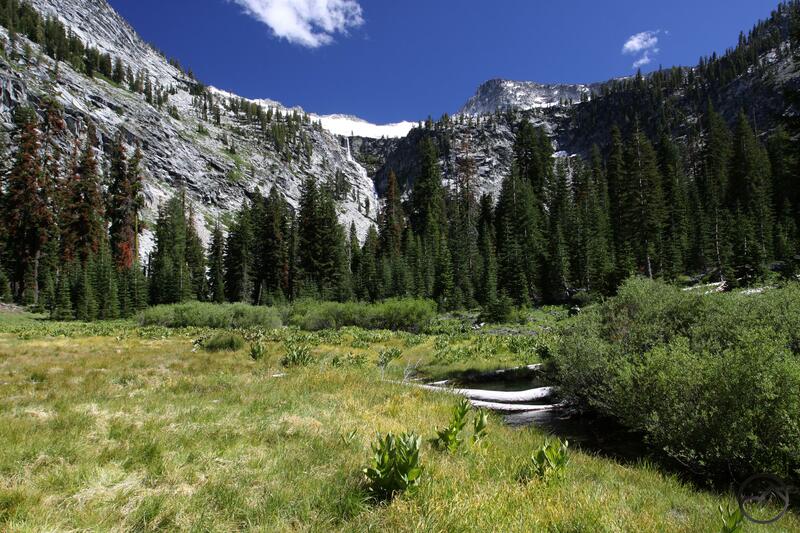 The Grizzly Creek Trail passes through the meadow and then enters another band of trees. Another campsite, this time situated alongside the cerulean waters of the creek’s best swimming hole, is found here. Beyond the second band of trees, the path winds through large boulder of white granite and crosses numerous spring-fed creeks. It soon passes a third, excellent campsite, this time with an unrivaled view of Grizzly Falls, which is only about 0.25 miles away. 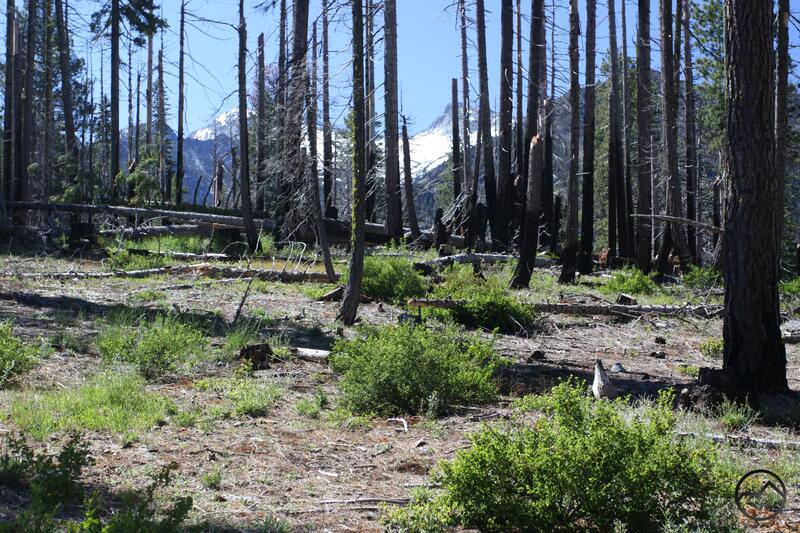 This marks the end of what the Forest Service recognizes as the maintained portion of the Grizzly Creek Trail. Beyond lies the legendary Grizzly Scramble. Grizzly Falls thunders above the Grizzly Scramble. The first part of the Grizzly Scramble is actually a well-established and maintained section of trail. From the last campsite the trail heads towards the falls, which crashes down the cliffs on the far side of a vast field of white, granite boulders. The trail winds its way through the rocks, often climbing up solidly constructed rock steps. The trail remains on the north side of the creek and constantly moves toward the ever-closer cliffs. Ahead the boulder field slopes upward and to the left, away from the falls, which still dominate the area. The well-constructed nature of the trail now vanishes and the scramble consists of a series of rough switchbacks climbing up the increasingly smaller rocks and loose debris that form the head of the boulder field. Ferns and grasses mark this uppermost section of the scramble through the boulder field. Near the top, a couple of cairns mark a cross-country route back down towards the falls. At the bottom of the canyon the route ends at the edge of the creek, just a stone’s throw from the base of Grizzly Falls. The entire waterfall is visible from this vantage point. It is a humbling and awesome spectacle. Looking down on Grizzly Meadow from the scramble. To continue up the Grizzly Scramble, return to the switchbacks through loose debris. They climb higher, all the way up to the base of the cliffs. From here, a short but easy climb through a rocky gully is necessary. Though it requires the use of hands, it is not a difficult climb and is completed in short order. About halfway up the gully the route intersects a small stream as it flows through the upper part of the rocky trough. Cross over to the left side of the water and continue to climb, now more moderately, up the obvious route. Once on top, a broad bench is revealed with great views down on Grizzly Meadow and beyond, down Grizzly Creek Canyon to the distant peaks of the epically remote western reaches of the Trinity Alps Wilderness. From the bench, the route climbs up to the base of a short (only 10 feet or so high) cliff over which pours numerous small streams. Proceed along the base of these, climbing toward the canyon wall. At the end of the band of cliffs, climb up through them to base of a large talus slope filled with increasingly large granite boulders. At this point there is not distinct route and it is necessary to do a fair amount of rock-hopping to continue the climb. Cairns mark the easiest route through the maze of rocks. Soon the climbing turns back to the south, toward the lake rather than toward the canyon wall. As one climbs higher trees begin to appear amidst the rocks. Eventually the route emerges at the top of a large granite slope and one of the most staggering mountain scenes unfolds for the eyes to finally feast upon. Glacial melt water cascades into Grizzly Lake. Grizzly Lake fills the vast cirque beneath Thompson Peak. To call the scene immense is a shameful attempt to describe how exalted this vision of alpine perfection is. Thompson Peak, the highest peak in the Trinity Alps and the second highest point in the entire Klamath Mountains looks down over the stunning scene. Clinging to the flanks of the mighty summit is the Thompson Glacier. The living ice extends from the base of Thompson Peak to the east toward Julius Caesar Peak. From the glacier bursts over a dozen large cascades, tumbling down the white cliffs toward the blue waters of splendid Grizzly Lake. At the southeast corner of the lake six large cascades converge on one of the lake’s small bays. It is a marvelous sight. The lake itself is one of the highest (about 7,100 feet), largest (3rd largest at 43 acres), and deepest (2nd deepest at 173 feet deep) in the Trinity Alps. 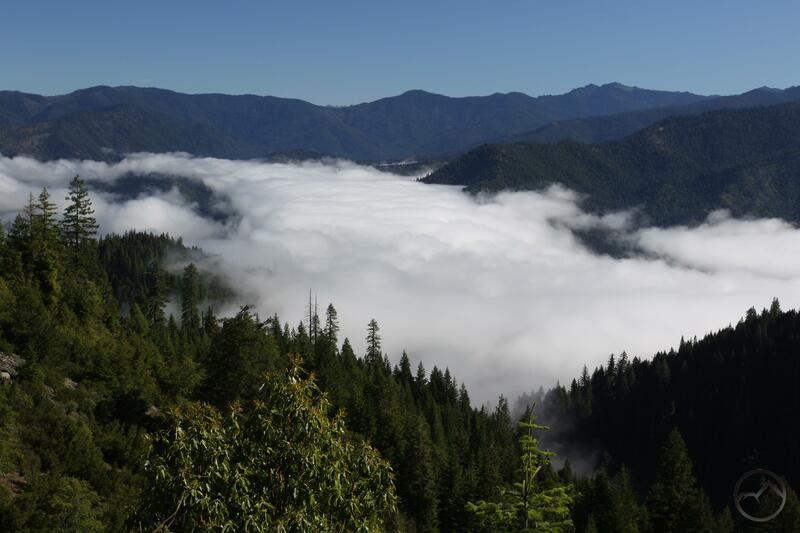 Indeed, it is one of the highest, largest and deepest in the Trinity Alps. It also happens to rank as the most spectacular. That consideration is secured by the lake’s mind-blowing outlet. Rather than having an outlet creek like every other lake, Grizzly Lake spits out Grizzly Falls directly from the lake’s waters. There is no outlet creek. 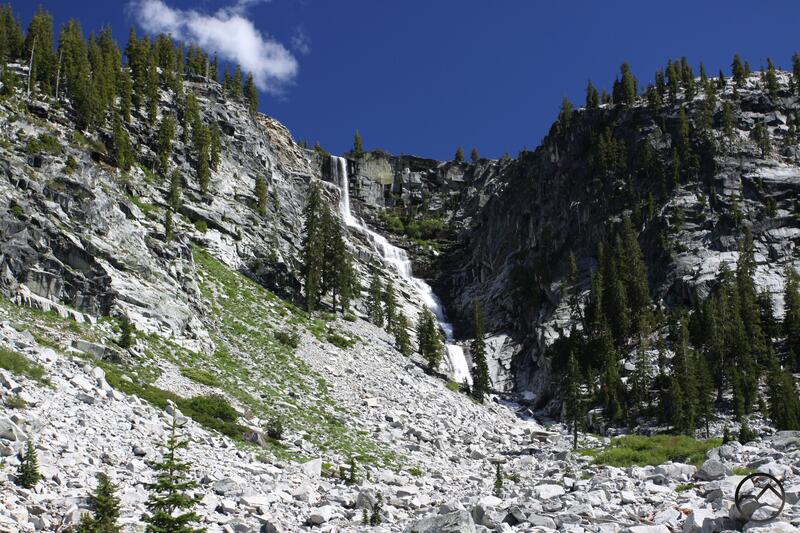 The water pours from the lake directly over a sheer cliff and falls 600 feet down to the large boulder field at the head of Grizzly Meadow. It does not get better than this. Grizzly Falls pours out of Grizzly Lake. On the far side of the top of the falls there is a large, flat bench. It is possible to leap across the outlet falls and clamor up to the bench. From there one can dangle weary feet off the cliff, adjacent to Grizzly Falls and high above Grizzly Meadows. The sound of the numerous cascades falling from the glacier, mixed with the roar of the falls is an unforgettable wilderness symphony. Though it is possible to camp on this bench, the area is heavily impacted and it is much more responsible to camp down at the meadow. This also saves the trouble of hauling a lot of gear and heavy packs up the miserably steep Grizzly Scramble. Enjoy the incredible lake and then return to the meadow and enjoy a fantastic sunset as the light creeps up the falls and sets the glacier ablaze. Fog-filled Salmon River valley from near the trailhead. From Mount Shasta City, drive north on Interstate 5 for 12 miles. Take the Edgewood/Gazelle exit, turn left under the freeway then immediately turn right onto Old Highway 99. Proceed north for 7 miles, entering the small community of Gazelle. Turn left onto the Gazelle-Callahan Road. Drive this scenic road for 24.8 miles, continuing another 2.1 miles after it merges with Highway 3. At the north end of the small village of Callahan, turn left onto the Callahan-Cecilville Road, which is also named Forest Highway 93. Continue for 27.7 miles on this interesting road. Turn left onto the road signed for the East Fork Campground and the Petersburg Ranger Station. Proceed for 5 miles. Just after the road crosses the Salmon River and the pavement ends, turn right onto the road signed for the China Springs Trailhead. This road climbs for 6 miles to the trailhead. It twists around tight turns but the road is in good condition and is passable in low-clearance vehicles. There is ample parking just after the trailhead, so avoid parking right by the trail. fabulous website with great information ! thanks a bunch for taking the time to compile this information! Hi there- wondering when you last did this trail and when your pictures were dated. Curious about what a spring-time hike up there would be like. 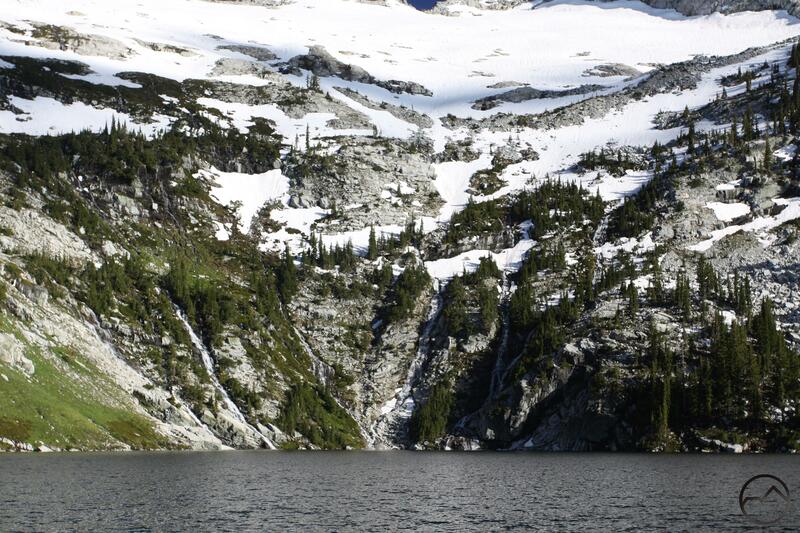 The images for Grizzly Lake were all taken in June of 2013. Normally, I would say spring is no-go up there because the elevation at the lake is over 7,000 feet. This year there is not much snowpack, so it might be the year to attempt a spring trip. You may have better luck getting there by coming in off of Highway 299, along the North Fork of the Trinity. It is a longer trip but easier. The road up to China Spring is long, remote, dirt and on the north facing side so there may still be significant snow drifts higher up. Good luck! Couple of questions, is the waterfall always going even in dry years like the past few, is it 14 miles total even with the 2 miles to get to the trailhead? Approximately how long would it take a 48 yr. Old with a total knee in fair shape. I have hiked pilot rock. And not read falls with no problems. Thanks for any info u can give. The falls go all summer, though they do get pretty small as things get late in the year. As far as how long it would take, that is pretty subjective. It is one of the hardest trails in the region. Is it 14 miles total even with the 2 miles to get to the trail heat or to you need to add on 4 more miles? Thanks for the info. Yes, it is 14 miles from the furthest point where you can drive your car to the lake and back. It should have said butrese falls. Thanks for the detailed information on this hike. I have the Trinity Alps & vicinity book by Mike White, Wilderness Press, however I really appreciated the greater detail you were able to provide on the website including pictures. Made it a dayhike by sleeping overnight in my van at the trailhead and thus able to get early start as it is a 3 hour drive to trailhead from Redding. It was arduous, almost 11 hours total hiking, and I’m dog tired today, but it sure beat the heat in Redding. Glad you made it up there. That sure is a long day. How much water was in the falls? I recently did this trail last week with my sister we put in at China creek trail head, my gps said it took us 22 miles round trip there and back. I’m not sure why in the books it says 13.6? We even called the ranger station to ask. We started hiking at 8:30 am and got back to car at 8:00 pm. Not an easy day hike. The views are breathtaking though, just be advised it appears to be way farther then 13.6 miles round trip from China creek trail head. Also heads up don’t bring dogs on this trail. Can you send me your GPS track? What about describing the trailhead and the beginning of the trail? It almost seems as if you started the hike several miles from the trailhead. I have a very hard time believing that my calcs and all previous calculations are that off. If your gps is off by that much, and another on the same hike is off by a wide margin from both prior measurements and your own track, it makes me think your GPS is suspect. Either way, even at 14 miles, I strongly discourage folks from hiking this trail as a day hike. It is a hard 14 miles and best done as an overnighter. I loved Grizzly Falls, was lucky enough to do Trails work up in the Alps with a backcountry crew, and made Thompson Peak a weekend journey. Gorgeous! Used your information here as a guideline for a trip to the lake this June- plenty of snow pack & flow out of the waterfall, only a few other visitors passed along the way and up at the lake. The scramble is nuts though with a pack on… we totally went too far and up the steep section and were clinging to the rocks! It really does seem farther than 8 miles out and back though, but I didn’t have a GPS on me so it could’ve just seemed longer since there is a lot of elevation gain right off the bat then for the rest of the trip once you pass the springs. Trip of a lifetime for sure though- that is country few will ever really see for themselves! I have done this hike twice, once around 2009 and then again last year in 2015. Surprisingly it took two of us nearly 5 hours just to go from the top of the waterfall to the peak of Thompson and back to the top of the waterfall. It was great and worth it, but it took 100% of my energy. The other 5 in our group watched us with their binoculars and could hear me yelling with joy from the peak. Since I’m now 59, I know I won’t try it again. We hiked to the peak with just a day pack, not the whole backpack. The China Creek steep hike with the backpack isn’t too tough if we only travel at 1-1 1/2 miles per hour. Hey, thanks for all the helpful info. I want to hike in to grizzly lake with my girlfriend in two weeks but I’m coming from Portland and don’t want to get locked out because of the snow. I’ve tried calling the Petersburg Ranger Station but no one answers. Has anyone been up to grizzly lake yet this year? Hiked it last year, but not this year. Getting to the lake and the tops of the falls was fairly easy, but it took me 5 hours to get from the top of the falls to the top of Thompson peak and back and that took all my energy. Hi, I’m planning a trip for mid June. 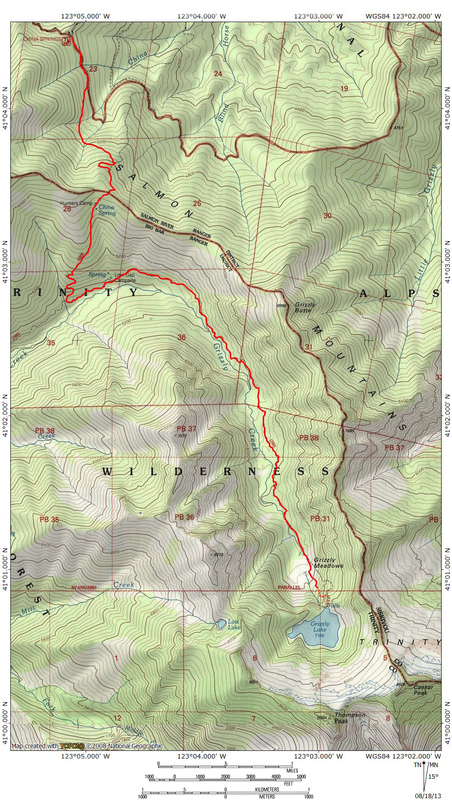 I will be taking the Hobo Creek route. Does anyone know if it is overgrown these days? Also I am curious to see if anyone has hiked to the falls earlier than June 20th in years past. Getting so close and being stopped by snow on the scramble would be disheartening. Any input would be greatly appreciated. Hi, I’m going that route last week of August. Did you do the hike? Anything I should know? Thanks for responding. I would ask you, is there cell service? And is pegleg camp a good overnight then the meadow the nex day? I hiked up to grizzly lake with my aunt in the mid 90s. I’m thinking of hiking it again in the summer of 2017. I was I thinking 16 or 17 users old. We backpacked alot of different places in northern California, and this one is stuck in my memory. I believe that we hiked up through China Creek. Is there any knew info that I should be aware of. Thanks for comments. Completed the hike on June 30th, thanks for all the detailed info…it was very helpful. Lake is still about 85% iced over and the cirque is full of snow. Trail is in good shape…recently cleared up to Hunters Camp, some brushy spots and deadfalls to navigate after that point. Look for the rock cairn on the right side of Hunters Camp, that’s the trail you need to follow. I got off on another branch (the original trail according to my GPS) but it is overgrown and littered with downed trees and brush…no fun! My GPS said 8.04 miles from trailhead to top of falls. The round-trip took 9.5 hours, including about 30 minutes for lunch, the extra scramble down to the base of the falls (it’s covered by a large snow drift), and picture-taking along the way. I travel light, move at a pretty good clip, and don’t rest much…YMMV. Spectacular spot, well worth the effort! Wow. I bet the falls were booming! Greetings, I’ve heard that the snow is really heavy on upper elevation loops in the Trinity Alps according to the Weaverville Ranger station. We’re likely heading up for a week long trip starting July 8-9. Any advice is appreciated. What were the snow conditions like when you’ve recently been there? There is still a lot of snow, depending on where you are going. It sounds like you are making some assumptions. I would advise caution. Bubba, thoughts on the dog-friendliness of this trail/scramble? Dogs OK, but only on leash. Disregard what I said about dogs. I thought you were referring to North Table Mountain. Regarding dogs on the Grizzly Creek Trail, dogs are fine. The scramble is another matter. I would not recommend it. My brother in law took his dog (lab) up to Grizzly Lake, but it involved hoisting his dog up several short but vertical sections and was not a single person job. Even then, the dog almost didn’t make it back. I did this hike on July 4th one year and we were caught in a snowstorm!